Despite a mixed weather forecast, the Saffron Walden Crank Up enjoyed plenty of sunshine over the weekend of 13th & 14th May. There were fourteen full size steam engines, the majority of which travelled under their own steam to attend, including the Worbey family with their Garrett Wagon 30826, and Geoff Scott-Coomber with the Fowler 16854 that both travelled from Bedfordshire. 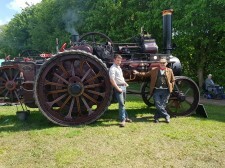 Matthew and John Garwood travelled over 20 miles from Castle Hedingham with the oldest Clayton traction engine no. 32900, owned by the Philp family, quite an achievement on steel strakes. Melvyn Camps and Martin Hunt exhibited the Sentinel tipper 6887 “Vectis Knight” complete with a newly restored Sentinel tipping trailer. Other local stalwarts included Kevin Swann’s Garrett 33358 “Lord George” and David Gowlett’s Fowler 10373 “Ada” from Wimbish, and the Pumfrey family with Ruston 50278 “Success”, while from further into Essex, Crank Up regulars Will Childs and Paul Whipps brought along Aveling Barford AC621 “Lady Helen” and Wallis 7372 “Loki”. The other steam roller attending was the Aveling & Porter 9246 “William”, owned by the Allen family. Former Society President Keith Honour was supporting the Leach & Overington concert organ with his Burrell showman’s 3926 “Margaret”, and the other Burrell attending was 3106 “Princess Royal”, owned by Richard Parrott and attending on Saturday only due to other commitments. The full size steam section was completed by the Foden D Type tractor 13068 “Perseverance”, owned by Peter Richardson and a regular at our events since the first EATEC rally in 1955, and Stephen Haylock’s Ransomes “Chieftain” 15278, in the care of Phil Starling. Another interesting steam exhibit was the Merryweather fire pump owned by Ian Couchman, which was pumping water from the river all weekend. These were joined by two steam cars, a number of miniature engines and many vintage vehicles, tractors, stationary engines and other attractions. Music was provided by three mechanical organs, including one that travelled from Doncaster to attend, and a live band performing in the beer tent. With a children’s fun fair, as well as trade stands and a craft tent, there was something for all the family to enjoy. We were saddened to hear that Paul Engelmann, who started the original Crank Up in the seventies, passed away the day before the event. A toast was raised to him in the beer tent on Saturday evening, and it was nice to see his La France roadster in attendance on Sunday with his son William. Nearly 3500 people visited over the weekend, making it the most successful Crank Up since it was revived at its current site in 2015. Next year’s dates will be 12th & 13th May.